You are here: Home > Dr. Neel Shah wants us to emulate this system of obstetric care??!! Dr. Neel Shah wants us to emulate this system of obstetric care??!! Dr. Neel Shah wrote a foolish, poorly researched article on homebirth, A NICE Delivery — The Cross-Atlantic Divide over Treatment Intensity in Childbirth, and The New England Journal of Medicine published it, apparently without having it reviewed by anyone who knows anything about American homebirth. Then he penned a piece for The Conversation, Are hospitals the safest place for healthy women to have babies? An obstetrician thinks twice, that expanded and amplified his themes. That piece was syndicated in multiple outlets including Time, Newsweek and The Washington Post among others. Dr. Shah’s NEJM commentary listed only 5 references, one of which was a piece in The New York Times. He simply ignored the existing literature on the outcomes of homebirth in the US; it appears that he didn’t even know that it existed. Dr. Shah did not appear to be aware that there is a two tier midwifery system in the US and therefore, the British study that he touted has no applicability to homebirth in the US. Dr. Shah claimed that we should emulate the UK in promoting a greater role for out of hospital birth. He waxed rhapsodic over the Birthplace Study that purported to show that homebirth in the UK is safe for a subset of women and the purportedly superior delivery of obstetric care in the UK. Is this the obstetric system that we ought to emulate? To put that in perspective, last year in the US obstetric malpractice claims came to $428 million, one third the amount of the UK payout, though the US has more than 4X as many births per year and a far more litigious culture. 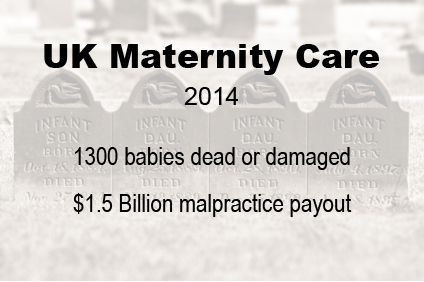 So on a per birth basis, the UK payout on obstetric malpractice is 1100% HIGHER than the US. Sara Burns, a specialist in negligence at the law firm Irwin Mitchell, said that some of the rise was down to a more litigious culture, but repetition of the same type of cases pointed to fundamental problems. “There is an inherent issue with the training of midwives,” she said. And that issue is treatment intensity. UK midwives favor low intensity treatment and that is killing babies (and mothers). Why did Dr. Shah write a piece extolling homebirth and the UK obstetric system when the evidence shows that homebirth in the US leads to as much as an 800% increase in the perinatal death rate and the UK system is being bankrupted by payouts for dead or brain injured babies that reflect the low treatment intensity that Dr. Shah favors? Why did NEJM publish such a foolish, poorly researched piece? In their quest for telling a compelling story, scientists too often sculpt data to fit their preferred theory of the world. Or they retrofit hypotheses to fit their data. Journal editors deserve their fair share of criticism too. We aid and abet the worst behaviours. Our acquiescence to the impact factor fuels an unhealthy competition to win a place in a select few journals. Our love of “significance” pollutes the literature with many a statistical fairy-tale. Let’s leave aside for the moment the fact that Horton, in his capacity as editor of the The Lancet, has the power to keep bad science out of his journal, but has not employed it. His critique is spot on, as Dr.Neel Shah’s recent piece on homebirth in The New England Journal of Medicine demonstrates. Fashionable trends of dubious importance? Check! Dr. Shah’s piece capitalized on two fashionable trends, the demonization of C-sections and an infatuation with homebirth. Sculpting the data to fit a preferred theory of the world? Check! Dr. Shah is looking for ways to save money on healthcare and he thinks obstetrics is the place. He started with the conclusion and didn’t even bother to check the literature to see if it supported that conclusion. Ignoring the existing scientific literature on US homebirth, relying on a British study that is inapplicable to the US, and apparently unaware of the deadly and extraordinarily expensive result of midwifery led low treatment intensity care, Dr. Shah crafted a fairytale … and then disseminated that fairytale far and wide. How? By relying on the fact that both scientific journals and mainstream publications are obsessed with fashionable trends of dubious importance. I must admit I find the differences between the UK system and the US one fascinating, having spoken to quite a few women who had similar issues to me only on the other side of the Atlantic. My son was born almost six months ago in the UK and his arrival was the second worst experience of my life. I had a perfectly healthy pregnancy, did everything I was advised to, exercised, ate well and attended the ante-natal classes where we were not allowed to discuss c-sections, forceps, inductions or anything which wasn’t “normal”. I suppose that should have been the first hint. My waters broke prior to the start of labour, on Friday the 13th of all days… so I did what I had been advised which was phone the hospital. They told me to come in so that they could confirm that it was amniotic fluid etc. It was, they checked my heart rate and the baby’s, then said I would more than likely go into labour by myself but to make an appointment on the Monday to be induced if things hadn’t progressed. Not knowing any better, I agreed and went home. A couple of hours later I started with agonizing back pain, the sort which went from my back into my thighs and then locked my muscles out. By Saturday night, I was having 3 contractions in 8 minutes so went back to the hospital. I explained how bad the pain was, in fact I got stuck on a birthing ball twice in front of a midwife but was told that it was just “normal” for me and that because I was only at 2cm I could either go on a ward and wait to be induced on Monday if things didn’t hurry up or I could go home. Because I couldn’t face being in a ward by myself (they would have sent my husband home) and because everyone was saying that this was “normal”, I went home. Sunday passed in a blur of pain with me frantically trying to find a position that helped, whilst attempting to do my own research into just how “normal” my pain was. Having reached conclusions that I was less than happy with, I went back to the Hospital on the Monday only to be told that because there was a queue for the labour ward and I was clearly not in active labour, it would be tomorrow at least before my labour was augmented. I pointed out that a. I was in agony, b. I kept getting stuck and c. my waters had been broken since Friday night and according to Dr Google that’s far from ideal for the baby however at that point apparently none of that mattered. Instead I was told if I was that worried, go for a walk around the hospital to speed things up. So leaking amniotic fluid everywhere off I went with my husband pretty much holding me up. We walked around for over a mile, each contraction feeling like a knife in my back, each step causing fluid to seep out of me. When I got back, I was examined and found to be at 5cms, suddenly I was at the top of the queue for a labour room. Despite my son only being partially on the cervix, I managed to make to 10 cms with the help of the drip. However the pain was so bad as the drip ramped up, I thought I was going to die and whilst I hadn’t wanted an epidural, the little voice in my head whispering “he’s stuck, you know he is” coupled with the pain made me ask for one. (This by the way is according to my Mother the point where I really screwed up). The lovely Anesthetist finally managed to the epidural in after around 30 minutes of trying but it didn’t work. What it did however was cause my diastolic blood pressure to start heading south fast. I was already on a saline drip before hand because they thought I might be dehydrated and this probably wasn’t helped by the fact that I was clung to the gas and air to help me deal with the horrific pain. Eventually the Anesthetist was cornered and managed to the epidural working properly apart from a patch in my thigh but as the night progressed my blood pressure got lower and lower. I pushed for an hour and a half with no movement on the part of the baby at all, pushing almost to the point of passing out. During this, my son’s heart rate started to decelerate, with hindsight understandably and the oxygen samples they were taking nose dived. So around 81 hours after my waters had broken, they suggested that they try forceps in Theater and move to a c-section if that failed. Having decided that I had a bit of a “flat” pelvis but knowing that I was 5 foot 8 and that my son was likely around 6 to 7 pounds (I’d had a scan at 35 weeks), they kept reassuring me it would work. Knowing it wouldn’t (it’s weird that, but I knew deep down on the Saturday night that it would end with a c-section, I was just in denial because “normal, natural blah blah blah”) I kept smiling. He didn’t move because he was firmly stuck on a bit of bone and I managed to refrain from saying “I told you so”. During the operation to free him from my pelvis, I lost the plot however. My blood pressure despite their best efforts (drugs, saline, hands crossed over my chest etc) kept dropping and I wandered off and managed to relive the worst event of my life, being raped whilst my son was being born. On regaining consciousness I was somewhat surprised to discover not only there was a baby in the room but that someone was trying to give him to me. The Doctors themselves admitted they thought his apgar scores would be much lower than the 9s he got and I was told to keep an eye out for signs of cerebral palsy. He also had to spend a couple of days in the Neonatal unit which whilst helping me get out of bed straight away, gave me plenty of time to blame myself for not demanding to see a Doctor on the Friday night. I’ve since been diagnosed with PTSD not for the birth itself but for the trauma of being raped that my mind decided to make as fresh as the day it happened. It also negatively effected my relationship with my husband because in my waking dream, he was looking on and did nothing to help me and now every time I look at my son, that hateful evil memory burrows its way to the front. Here is another story about a baby being killed and a family devastated because during labor, British midwives failed to report the baby’s concerning heartbeat to OB’s. By the time it was finally escalated, it was too late. WTF is wrong with these people! This is OT, but given the nature of this blog and the aversion to “Eebil kem uh killz” on the part of the crunchies it rebuts, I thought you guys might get a kick out of it. It appears to be tempting to follow current fashion and ideology to get a profile and a following. Machiavelli’s advice to the Prince was that popularity came at too great a cost. If you want to be a successful leader, don’t also aspire to be popular. Keep in mind, dead babies don’t sue, mostly maimed ones do. Sadly, the costs of a dead baby are far lower than the costs of a brain damaged one. Dead mothers might give way to wrongful death claims – injured mothers’ claims tend to be small. There is likely a large swath of injured moms and babies whose claims were too small to be “worthy of pursuit”, as such the litigation payouts should be considered underestimates of damage. Maternity and obstetrics is the last place where money saving ought to be the priority – the time horizon over which the benefits of adequate care accrue is substantial. The return on investment is likely better than most areas of medicine as a result. The desire for “low intervention” in birth seems misplaced – and somewhat like refusing to where a bike helmet or to do up your seat belt because “risk is low”. Low risk is a small part of the equation – equally important are the costs and benefits of taking precautions, and the reality of what happens should an adverse event occur. Might there be a trade off – absolutely! However, it might well be a “good bargain” in the bigger scheme of things. I’d also argue that it isn’t actually “low risk”. Low chance of a bad thing happening, sure, but those bad things are really catastrophic when they do happen! To me, a low risk is something that isn’t likely to happen and isn’t generally that bad if it does happen. But then, I’m a pretty risk-averse person overall. And I agree completely with everything you’re saying, I just hate it when birth is called low risk simply because the chance of bad things happening isn’t all that high. It’s a personal pet peeve. And he was editor in chief in 1998 when Wakefield got his article in. Oh, dude, you have no room to talk. Especially since your article did NOT reference your little faux pas. I’ve been saying for years that the obsession with ‘caesarean rates’ and reducing them ‘at any cost’ is dangerous and unethical given the evidence available. Women deserve to receive unbiased information so that they can make informed decisions – whatever their decision. The RCOG, RCM and NCT published guidance in 2012 that maternity organisations and charity groups complained about but nothing was done. That’s just appalling. Ideology has no place in medicine. Just wanted to say “hi Pauline.” Thanks for what you do. Thank you. I’ve said it before and I’ll say it again: if Dr. Shah wants to act as a bean counter, he needs to count ALL the beans. I’d also say that anyone whose (very recent) training has been restricted to two of the biggest ivory-tower maternity centers in the US (both with excellent midwifery groups practicing) is probably NOT well-equipped to discuss what happens in the country as a whole, particularly since he seems clueless as to the whole CPM/CNM/CM controversy. Shah needs to read more Tuteur! US had only 500 mil in obsetetric malpractice payments per year? That actually seems fairly small. Yeah, all that medicalized birth really leads to problems…oh wait. It’s too bad some of those NHS midwives will only admit to who needed interventions after the fact. It seems small to me, too, but according to Diederich Healthcare, a division of Diederich Insurance Agency, total malpractice payments for the entire medical profession amounted to less than $4 billion. Then why are skyrocketing malpractice premiums given as the reason for unaffordable healthcare and a shortage of doctors? Could you add that up for me, because I don’t see the light here. I found this source citing medical liability costs of $55 billion (in 2008, so not directly related to the $4 billion quoted above). It *feels* like costs could be reduced in this area, to the benefit of the public. This type of analysis is admittedly way beyond my knowledge base and training, but I would like to have a better grasp of it. “the costs of malpractice insurance, claims and legal fees and doctors practicing “defensive medicine” to avoid being sued” as well. If I understand the Times of London piece that I quoted, the $1.5 million cost in the UK was for malpractice payouts only, but perhaps they did not report the costs correctly. In any case, $1.5 billion, whether it represents payouts alone or associated costs, is an extraordinarily high figure. I have an idea for cost cutting in the US! In the last 5 years I have seen a huge rise in workers who are bribed into getting a yearly physical exams so that they can save on their insurance premiums. If they jump through all the hoops, they save on average $200 total. I guess the idea is if the insurance bribes workers to get a physical, they will be healthier and save $ in the long run. But it does nothing of the sort. First of all, benefit of a yearly physical in those of working age is not even supported by science. To make it worse, the vast majority of the workers who take advantage of the offer are already seeing their doctors regularly. They are the organized, rule-following type that doesn’t mind filling out forms. They are already healthy. And then what the forms require me to do is crazy! Even if a person has always had perfect cholesterol and blood glucose, I have to recheck it every single year or they don’t get their $200. Some require me to do a yearly screening pap even though that is now specifically recommended AGAINST by ACOG. The worst are the ones that require me to draw a blood nicotine metabolite level to prove whether a patient smokes or not. This test is a special send-out test that has to be shipped out of state and costs god knows how much, all so the workplace can have proof for what it should know already, that patients who say they don’t smoke and who never go outside for smoking breaks at work actually really don’t smoke. Who would have thought! Is it bad for your cervix to get too many paps? Like say, twice a year for a decade or two? It’s not bad per se, just unnecessary for adequate screening. That’s of course, different than frequent paps to monitor an abnormality or problem. Physicals, gynecological, urology screenings, pediatric check ups, vaccinations, all that preventative stuff is no cost to the patient if they choose to take advantage of it. No discounts and all that. Instead they launched the LiveWell incentive. If an employee completes the modules they can choose to get $50 extra in their paycheck every quarter or a $50 gift card to like Staples, Bath and Body Works, lots of stuff. You have to complete two modules on subjects the company wants their employees to be aware of. One of the modules at the first of the year was recognizing signs of depression in the work place and resources available if you suspect you’re depressed. Also what not to say to a depressed person. Another one was on how to break up excersize times into smaller activities, with examples of the small activities you can do even at work, and how it adds up and is much easier than getting a gym membership you’ll never use. Then you have to complete a goal for usually four weeks from different areas. One is life organization which includes things like smart budgeting, tracking where and how you spend money, another section is to get moving which suggests setting an alarm to go off every 90 minutes to remind you to stand at work, just stuff that can help in different places to help de-stress life and make excersicing less daunting. Even turning off phones and TV while at dinner and having a conversation with your family in the evening over dinner for four weeks to facilitate more healthy communication in families. The hospital dietician also comes to a team meeting at least once a year with strategies in how to improve health. That one actually counts for one of the three LiveWell modules to get the money. We’ve seen a lot of success so far. It’s still pretty new but 67% of employees finished and claimed a reward last quarter. Seems a lot more productive than forcing people to get physicals they don’t need. Do you think it’d work better than the other models of get your physical and get $200? That sounds amazing. Which insurance company administers this program? It’s done through Select Health insurance for the Intermountain Healthcare chain of hospitals. I’m hoping other businesses and insurance companies catch on. It seems a lot more engaging and educational. physical” or many of its components. Plus, the insurance company does t even care who does them. In my area these people can have them done at an urgent care center where the doc doesn’t even know them! I would much rather see incentives from insurers for exercise, quitting smoking and other lifestyle measures than the mostly useless yearly physical (though I admit it occasionally gets a patient to the office who would otherwise ignore all of their medical issues and never come to the doctor). I briefly tried working at a different biotech in the area, and they had the intensive annual physical thing, the physicals done by some contracted nurses. I went back to my old workplace, which has an onsite health clinic with regular employees that offers basic care and vaccination, workplace-based support for smoking cessation and weight control, and an onsite gym (which contracts out PT hours to a local professional PT). Oh, and they give you bonuses to bike or run to work. I like this model better. They did this at my work, and because we need the money, my husband and I jumped through all the hoops. Wow. I didn’t realize this was a thing. That’s bad. I don’t think it’s about making the workers healthier because they got a physical. It’s about making more hoops to jump through so that workers will go with other available options for insurance. If an employee has the option of covering their family with their employer sponsored insurance or on a spouse’s employer insurance that doesn’t require jumping through all the hoops, they may pick the spouse’s insurance if the savings aren’t worth jumping through the hoops. Every year I watch the hoops get more numerous and complicated at my employer while the savings compared to my husband’s insurance (no additional hoops) decreases. I don’t think so, since these programs are created and sold by the insurance companies themselves to the companies we work for. They did this at my former employer.. but it really wasn’t a ton of hoops (finger prick for glucose and cholesterol, done in a retail pharmacy setting). I think it can be ok, but there needs to be a reasonable way to go about it. And I am not ok with annual physicals being removed from preventive care. For those with health conditions, they are important. If they get kicked off preventative care it will be just another office visit subject to deductible and skipped by many. There’s no requirement to do the full physical, if the doctor does not feel it necessary/recommended. It can be a simple chance to talk, go over any meds, and get any ‘doorknob’ questions out of the way. A big problem with this article is that Dr Shah is lumping in OOH births and midwife led births as though they’re the same thing. They’re really, really not in the UK. More women give birth in MLUs that are part of hospitals than give birth at home or in freestanding birth centres put together. I’ll say that again: most British women who give birth assisted solely by midwives do so IN A HOSPITAL. But the UK midwifery system is broken. Babies are dying because midwives are more interested in “normal birth” than whether babies live or die. There’s nothing about the UK system that we should emulate. I didn’t suggest there was. But that doesn’t really have anything to do with the fact that he’s wrongly conflating midwife led birth and OOH birth. I see no acknowledgment from him anywhere that most midwife led births in the UK take place in hospitals. Same in Aus. Virtually all public hospital low-risk births in Aus are managed by midwives (who are almost all specialist nureses) until referral to a resident or OB. Home birth is really a fringe movement here (LB notwithstanding), and so-called “birth centres” are the lower-tech parts of hospital labor wards. I suspect that’s what Sarah is referring to, although the UK has much more HB than in Aus. Hmm. I don’t buy this argument. The variation in payouts per capita between states is bigger than the difference between the US and the UK. I’m not sure what significance you attribute to that (i.e. why you think it matters). There may also be variation between counties or regions in the UK, but that doesn’t change the fact that a country 1/5 the size of ours, with 1/4 as many births somehow ended up having a TOTAL (not per capita) payout three times higher than ours. Another reason why the UK is less lawsuit happy is because you’re a lot less likely to have to sue someone to get money for the care of an injured person. If a baby is injured during birth in the UK, they will have access to publicly funded social care, special needs education, disability benefits and possibly council funded home adaptations. Those systems are all far from perfect, but they exist. As I understand it, there are American families who are left in the position of having no choice but to sue somebody because that’s the only way the injured person will be able to get the care and assistance they need. Yeah, that actually probably is the key reason. I think probably. Brits do make a lot of lawsuit jokes at Americans expense, but it’s arguably inevitable in a system where the statutory and welfare protections are so much less extensive. This is a really important point, because these additional costs have not even been factored into the $1.5 billion figure. The costs, plus payouts to people who never went to court are included in the UK figure but not the US. Plus I think that the amount of money paid out is a poor indicator in and of itself, when we have an actual record of the number of errors, injuries and deaths. 1300 for the UK. Not sire what a similar figure for the US is… pretty sure noone counted. I agree that it would be useful to know the number of claims paid out in the US (i.e. the number of dead or injured kids or moms). If someone has that info, please post it here. That said, I don’t see anything in the link we’re talking about that indicates that payouts to people who didn’t go to court are NOT included in the US figures. Those figures represent don’t represent jury verdicts–they represent payouts from malpractice insurance. In other words, they include people who never went to court. As for suing for up to 20 years after birth, I doubt it. Every state, and the law of England, sets deadlines for suing on various matters that are typically on the order of 3 to 6 years. The only way to extend that period is if you don’t discover the harm until much later–for instance, if your maternity ward switched your baby at birth with someone else’s, and you had no idea that had happened until the kids were 17 years old, you could probably sue then even though it’s 17 years later. But I cannot imagine a birth injury that you wouldn’t know about for 17+ years, so I can’t imagine being able to sue that long. No, in common law and in most US states therefore (don’t know if England has changed this) statutes of limitations are tolled for minority. That means, the statute of limitations, the period you are discussing, does not even START to run until the plaintiff, in these cases the injured baby, turns 18.